Fiona, one of the founders of Beleura Veterinary Hospital, describes her passion for science and animal health as ‘lifelong’. In 1990, Fiona began to turn passion into profession, studying science at Melbourne University before moving on to study veterinary science at the University of Queensland. Fiona’s career eventually brought her back to her hometown of Melbourne and she moved to the Mornington Peninsula in 2007. Inspired by the peninsula’s people and pets, Fiona and fellow visionary Penny set about creating a veterinary hospital that would bring the highest quality care and facilities to the area. Beleura Veterinary Hospital was born. Fiona lives with her husband, three children and their Jack Russell, Dizzy. Veena completed her veterinary science degree at the University of Melbourne in 2010. After a brief jaunt around Europe, she spent 2 years working in a small animal practice in Central Gippsland. Beleura was blessed with Veena’s presence in 2013. Her caring, can-do attitude and infectious positivity quickly made her a practice favourite. Veena left us in 2015 to work and travel in Asia, but we knew (hoped!) she’d be back. Though she’s already accomplished to the hilt, Veena is currently taking her skills to a whole new level, studying for her Masters of Veterinary Studies in Small Animal Practice. Veena’s furry and feathered family includes two mischievous terriers, Monty and Chika; her loveable cat, Charles; and Pedro the chirpy budgie. Most kids want to be superheroes, astronauts or princesses when they grow up. But Leah, who spent much of her childhood on her grandparents’ farm, knew she was going to be a vet from an early age. Fast-forward a few years and Leah’s determination had grown with her. She began her studies in Melbourne then moved to Sydney to complete her veterinary science degree. After graduating in 2014, Leah returned home to the peninsula. She came to Beleura on a graduate work placement and won us over with her cheery personality. We plied her with charm and chocolate biscuits until she decided to stay. 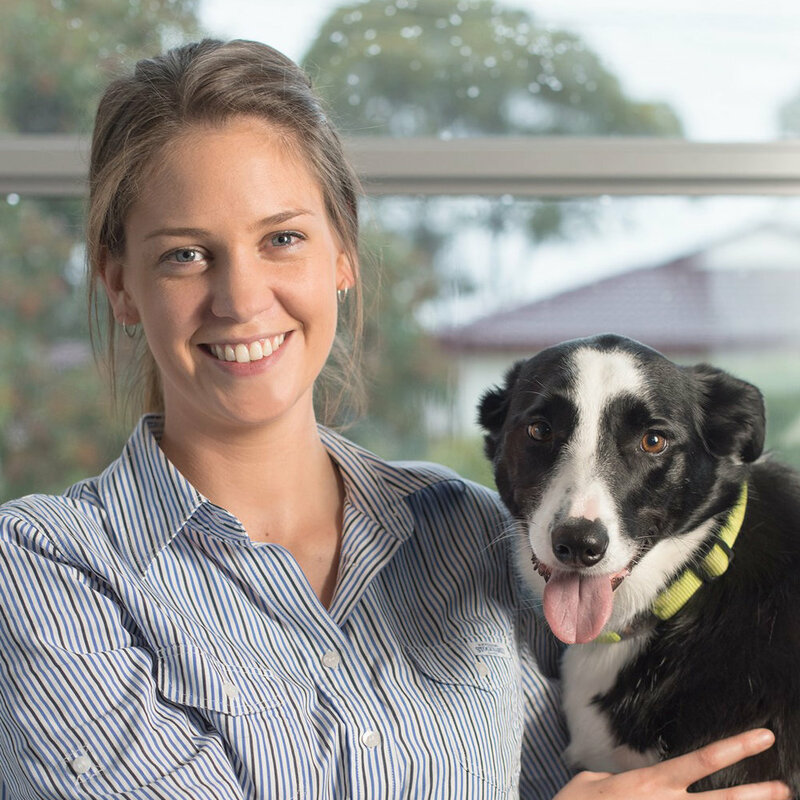 Outside work, you’ll find Leah exploring the local beaches with her Border Collie Zoe and Kelpie Bonnie, or at home pampering Darcy, her lazy and loveable ginger cat. There was once a boy from the Bega Valley who read way too much James Herriot. His family owned a cattle property and horse stud and the boy loved helping when the vets visited. The boy grew up, and his passion grew too. The boy found his way to Melbourne, falling in love with both Victoria and his new profession as a veterinarian. Where’s this boy now? He’s here. Bringing his gentle manner and endless patience to Beleura. Rob is an exciting addition to our team. His special interest in behavioural medicine is a blessing for members of the Mornington menagerie suffering from separation anxiety, noise phobia, excessive barking or aggression. Rob’s own family includes Labrador Sasha and crotchety cat Meg (oh, and his beloved wife and three adorable children of course!). From the moment the teenage Penny started working as a ‘Saturday girl’ at her local veterinary clinic, she was hooked. Determined to follow a career in veterinary nursing, Penny took on a full-time clinic position as soon as she graduated from school. After completing her veterinary nursing studies, Penny worked for 12 years as a small animal nurse. She then spent two years at an equine practice before returning to small animal nursing at Fiona’s practice in Mentone, where she worked for five years. Sharing Fiona’s vision for the perfect practice on the peninsula, Penny co-founded Beleura and has loved every moment of realising their dream. Penny lives in Mordialloc with her husband Quentin, their two children, Matilda and Jackson, and dogs Zena and Zahlee. Vet nurse Janeen felt called to work with animals from a very early age, and wasted no time in chasing her dream. Applying for a vet nursing job as soon as she finished high school, Janeen began her training shortly afterwards, and graduated as a fully qualified vet nurse in 1993. It was in that very first vet nursing role that Janeen met fellow nurse and Beleura’s practice co-founder, Penny Broadbent. 20 years later, life has come full circle, and Janeen and Penny are thrilled to be working together once again. Janeen loves helping and caring for all animals, and feels a particularly strong connection to cats. Her love and knowledge of all things cat-related reached new heights while working in a feline specialist practice, and Janeen now brings this depth of experience to Beleura’s feline clients and their families. In her spare time, Janeen loves hanging out with her family of two cats, Maybe and Ollie, as well as GG, the overly affectionate staffy cross, and Geoff, her very special human. We’re delighted Janeen has found her forever home here at Beleura Veterinary Hospital. For Dana, our front-of-house heroine, animal health is more of a calling than a career – she’s been working in the field since completing Year 12 and is now studying equine sports therapy part time. It goes without saying that Dana is an animal lover – her count currently sits at an impressive 14: three horses, one mini donkey, three goats, five dogs, one cat and a very cheeky Sun Conure parrot. She loves to ride and also shows Bernese Mountain Dogs. The first thing you’ll notice about our new addition Stacie is her ever-present smile. And smile she should! After 8 years in pharmacy, Stacie is now living her dream, studying to be a veterinary nurse while working with the Beleura team. Stacie’s passion for animals shines through in her demeanour and work ethic. She’s almost as devoted to her patients as she is to her much-loved English staffys, Ollie and Indie. Lifelong animal lover Emily completed her associate degree in vet nursing in 2016. Passionate about animal welfare, she finds enormous satisfaction in educating clients on how to best care for their beloved pets, while taking every opportunity to indulge in cuddles with furry friends large and small. Emily loves being part of the compassionate and meticulous team of vets and nurses here at Beleura, and delights in helping and comforting animals for a living, while playing with puppies and kittens every day. An experienced horse-rider, Emily loves riding with friends during her spare time, and is the proud owner of two horses, Buddy and Cooper, as well as her treasured rescue animals, dog Tex and cat Cuddles.